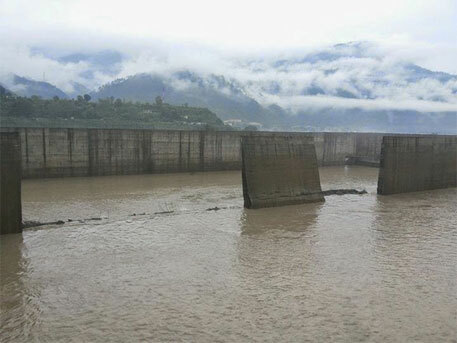 The walls of the desilting basin of the Srinagar Hydro Electric Project in Garhwal region of Uttarakhand collapsed due to heavy rainfall and the swollen Alaknanda river, a tributary of the Ganga, on which the dam is built. According to local people, four walls of the desilting basin—structure constructed just below a diversion structure of a canal to remove bed sand, and silt loads—which was overfilled due to continuous downpour, collapsed last week when the dam authorities were conducting a test run of the project. Earlier, residents of Naur, Kinkleshwar, Mani Chouraas, Gaursali, Naithana and Jyudisera villages had been repeatedly complaining to the dam authorities against leakage of water from the power channel canal of the project. After the walls of the basin collapsed, extra water from the canals overflowed and inundated several houses and fields in these villages. The 330 MW hydroelectric project, developed by GVK, has been mired into controversy from the time of its inception. The project was challenged in Supreme Court after activists opposed the relocation of Dhari devi temple, saying it would get submerged. In an affidavit submitted to the Supreme Court, the Union environment ministry had defended the right of people to worship at the temple, drawing a parallel with the Vedanta case in which the apex court had upheld the rights of the Dongria Kondh tribal people to worship the Niyamgiri hill, earmarked for blasting for bauxite mining https://www.downtoearth.org.in/content/moef-says-final-no-vedanta. But the Supreme Court order in August 2013 dismissed the Centre's plea and the idol was relocated https://www.downtoearth.org.in/content/sc-rejects-plea-against-relocating-dhari-devi. Bhawani Shankar, an activist based in Srinagar, said the terrain is not fit for construction of such huge structure. The river bed is highly unstable and before the hydropower project, a medical college was proposed to be built at this place. But it could not be built because of the nature of the land. “A portion of Srinagar Garhwal University that lies in the river bed, is gradually caving in. But the dam’s capacity was increased from 200 MW to 330 MW without any thought and concern for environment and geomorphology of the place,” he said. Mishaps are not new at the project site. In 2008, 2009 and 2010, the coffer dam of the project broke. Such repeated accidents expose the poor quality of the construction at the project site, alleged Vimal Bhai, convenor of non-profit Matu Jan Sanghathan. Vimal bhai is also fighting a case against the dam authorities, seeking compensation for families who suffered damage due to irresponsible dumping of debris by the project authorities during the Uttarakhand floods last year. The project was inaugurated in March this year by Uttar Pradesh chief minister, Akhilesh Yadav. Dipendra Negi, sub-divisional magistrate of Tehri Garhwal, said that officials have surveyed the area and have directed the dam authorities to carry out the repair work as soon as possible. Down to Earth correspondent tried to contact GVK authorities but failed to get any response.